Note the price of $1.75 for one computer. Peter Sellers was seen using one of these in the Dr Strangelove film. I think they were also given away to people attending some of the early performances of the film. This calculator surfaced in Greece but is probably of US origin. No author information is shown but its reference number is 6LS-2820. Its purpose is to calculate the amount of a chemical agent required to saturate a target using a number of different delivery systems [e.g. 4.2″ mortar, howitser, rocket or 100 gallon airborne spray tank]. The back of the calculator refers to agent GB. That is the nerve gas Sarin. The directions also refer to agent HD. This is mustard gas. Agent VX is the VX nerve gas. Under the UK’s Rainbow Code system VX had the code name “Purple Possum”. The disk refers to the US Honest John and Sergeant missiles as possible delivery vehicles. Honest John was first deployed in 1953 [and remained in the NATO arsenal until 1985] but the M139 chemical weapon warhead was not available for the Honest John until the 1960s. The Sargeant missile was deployed in Europe from 1963. A chemical weapon warhead option was considered but the development project was cancelled in 1970. The calculator consists of three disks. The largest is made of card and is just under 5″ [125mm] in diameter. It is fairly crudely made compared to the very high quality Cold War calculators later produced by Perrygraf. Please leave a comment if you have any more information on this calculator. A rare British Cold War calculator. Presumably intended for use by civil defence after a nuclear attack. 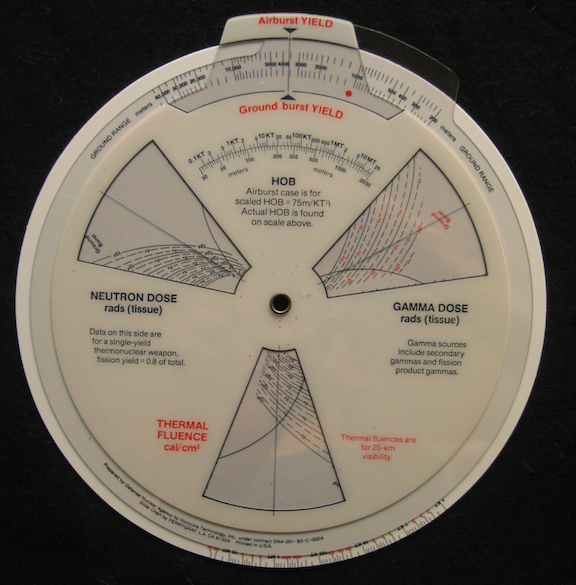 The MSIG – 1 Multi-sigma slide rule was produced by the US Defense Nuclear Agency to assist military planners in calculating the probability of damage resulting from a nuclear detonation. The rule is 8″ [205 mm] in diameter and produced by Perrygraf. It was designed by the DNA and is dated April 1987. This rule is very collectable but the hardest to find of all the DNA slide rules. The one shown was never issued and is in mint condition. The MSIG -1 was the last slide rule to be produced by the DNA. After that they only supplied software for use on desktop and hand held machines. A list of the slide rule and software can be found in this post. 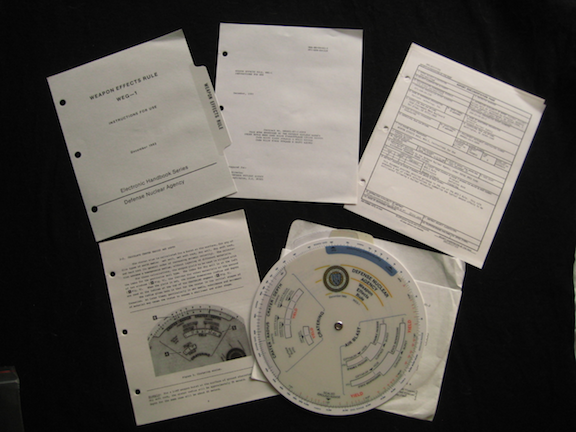 The complete package as issued consisted of a binder, hard cover, documentation, slide rule and two floppy disks. The Defense Nuclear Agency was an offspring of the Manhattan Project and is now part of the Defense Threat Reduction Agency. In its various guises it had many responsibilities connected with America’s nuclear weapons programmes. 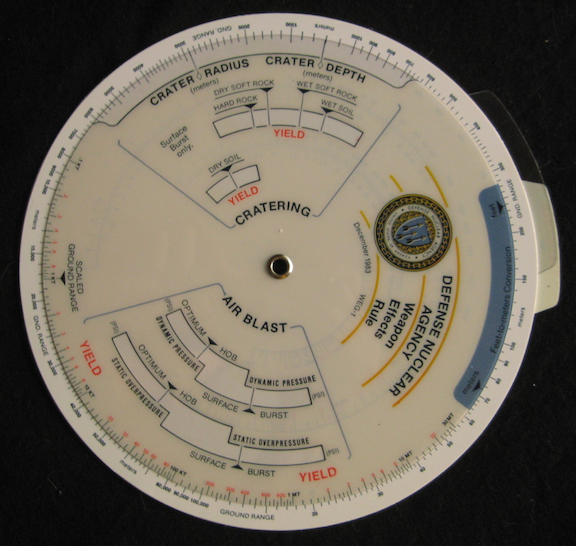 In the 1980s and 1990s it produced a series of calculators to help the military plan its nuclear attacks on targets in the USSR and other countries. The US had a list of target Vulnerability Numbers [see this post]. Planners could use these numbers and the DNA calculators to decide whether a bomber, a submarine launched missile or a ground launched missile be used against a target [they had different levels of accuracy] to achieve a specified level of damage and probability of success. The first calculators were circular slide rules, designed by the DNA and produced by Perrygraf. These rules are now both very collectable and very rare. A list of these rules is below. This blog has posts on all these. The list is incomplete because the DNA produced a Damage Prediction Rule VN – 1 in 1982 [see this post]. As soon as a introduction of the IBM PC created a technical standard for personal computers the DNA began producing nuclear targeting software programs. Some of the DNA’ss programs duplicated the functionality of the above slides rules. The Multi-sigma Damage Prediction Rule was produced as both a physical slide rule and as software programs for hand held and desktop machines. Programs for a long list of other targeting functions were added to the DNA catalogue. There were three versions of the Nuclear Bomb Effects Computer. The first was designed by EG&G. “EG&G, formally known as Edgerton, Münchhausen, and Grier, Inc., was a United States national defense contractor and provider of management and technical services. The company was involved in contracting services to the United States government during World War II and conducted weapons research and development after the war.” Wikipedia. The calculator was based on test data published in the first edition of the ‘The Effects of Nuclear Weapons’. The calculator is made of plastic and is 4″ in diameter. A complete set consists of the calculator, a red and white sleeve and an instruction pamphlet. This cold war calculator is very rare. A revised version of the calculator was designed by the Lovelace Foundation. See this post for more information. Like V1 this calculator is very rare. The third version of the calculator was also designed by the Lovelace Foundation. Its design is much improved over the earlier versions and is based on a revised test data set which was published in the second edition of the ‘The Effects of Nuclear Weapons’. The calculator is 5″ in diameter and is made of plastic. This version is not rare. Copies of the calculator were on public sale for $1 along with the revised edition of the ‘The Effects of Nuclear Weapons’ for $3. The calculator was used as a prop in the Dr Strangelove film and copies were given away to promote the film. See this post for more information. Cold War Weapon Effects Rule designed by Horizons Technology for the US Defense Nuclear Agency and manufactured by Perrygraf.